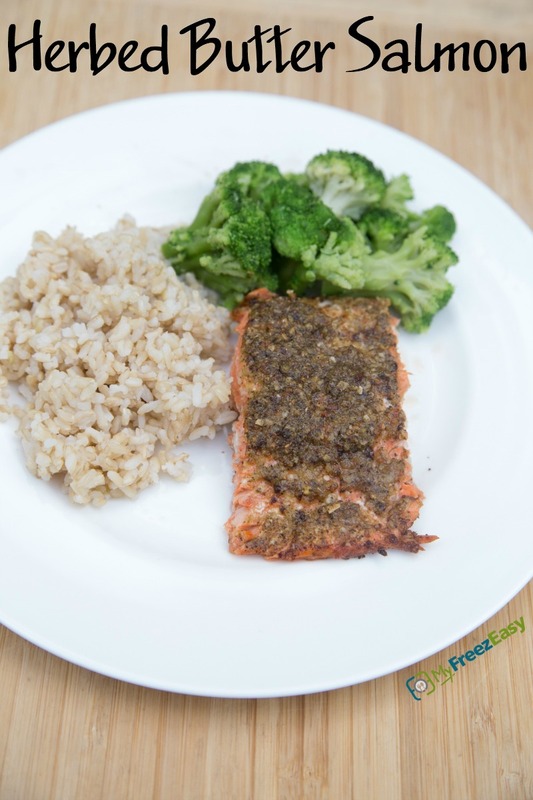 Love this powerful flavors of the homemade herbed butter that are drenched onto and baked into the salmon fillet. Serve this with a salad and your favorite salmon sides like mashed potatoes, cauli-rice (for low carb! ), rice or dinner rolls. Set out the butter to soften. In a small bowl, press the butter with a fork to flatten it and then add the dried basil, rosemary, thyme, salt and pepper. Gently fold it all together with fork, small butter knife or small spatula. Add the butter to a piece of plastic wrap and roll and shape it into a log and then slice into 8 pieces. Cut salmon fillet into 4 pieces. Place in small baking dish and add 2 slices of the herbed butter on top of each salmon. Bake in the preheated oven for 15 to 20 minutes, or until salmon is no longer pink in the middle. Prepare the veggies and cauliflower rice. 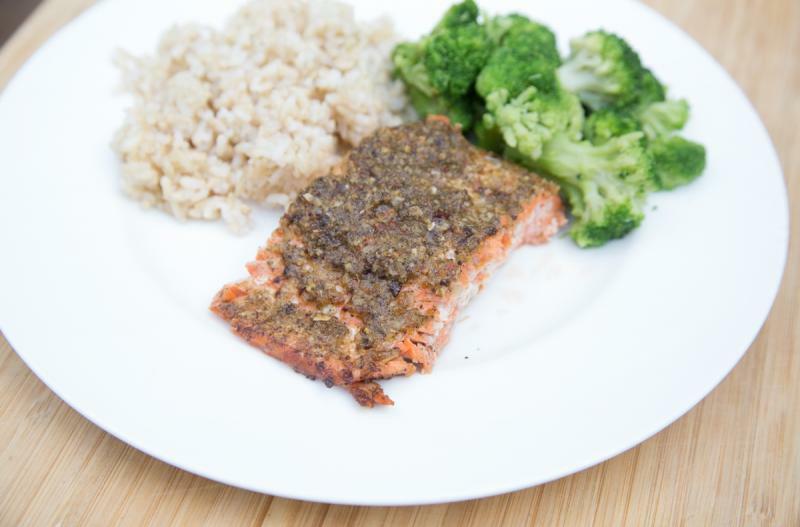 Serve Herbed Butter Salmon with veggies and cauliflower rice. Cut 2 lbs. of salmon fillet into 8 pieces. In a small bowl, press 1 cup butter with a fork to flatten it and then add the 2 tsp dried basil, 2 tsp rosemary, 2 tsp thyme, 1 tsp salt and 1 tsp pepper. Gently fold it all together with fork, small butter knife or small spatula. Add the butter to a piece of plastic wrap and roll and shape it into a log and then slice into 8 pieces. Put baggie in the freezer and freeze up to 6 months in fridge freezer or 12 months in a deep freezer. Thaw in the fridge overnight, or a warm bowl of water for about 20 minutes, before transferring the salmon and herbed butter to baking dish. Bake at 400 F for 15 to 20 minutes. Use clarified butter and serve with cauliflower ‘rice’ for Paleo/Whole30 meal. Recipe is dairy-free when made with dairy-free margarine. Recipe is gluten free when served with gluten-free sides. Thaw completely, then bake at 400 F for 15 to 20 minutes, or until salmon is no longer pink in the middle. Serve with veggies and cauliflower rice.